Graeme McDowell improved his position at the RBC Heritage event before heavy rain in South Carolina forced play to be halted during Friday's second round. 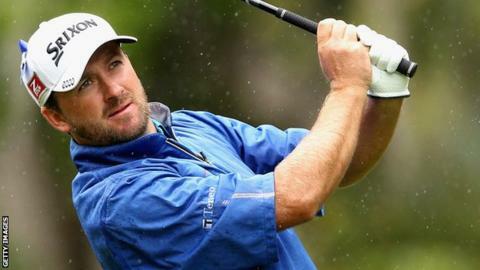 After a level-par 71 on Thursday, Northern Irishman McDowell picked up birdies at the second and sixth holes to move to two under. When play was suspended, the former US Open champion still had 12 holes left. KJ Choi was leading on five under par after the day's standout round of 67 at the Harbour Town Golf Links course. The South Korean had six birdies and two bogeys on a day in which many of his fellow professionals struggled in the inclement conditions. The rain eventually ensured play was abandoned at 14:54 local time, with PGA Tour vice president of rules and competition Slugger White hopeful of completing the second and third rounds on Saturday. He told the PGA Tour's official website: "We can't play anymore. It's pretty bad out there right now. "We probably have about four hours left of golf (to finish round two) and if we can start tomorrow at eight, we'll try to turn it around and get the third round in and get back on track Sunday somewhere."